Thickening: Allowing the formulator to obtain the desired viscosity and texture (known as “mouthfeel”). Particularly important with low calorie or sugar free products where the bulking effect of sugar must be replaced. Many different products are used, including xanthan gum, pectin, etc. Stabilising: To keep particles (e.g. fruit pulp) in suspension. Several products are used e.g. CMC, starches, propylene glycol alginates (PGA), pectin and gums such as guar and gum arabic. Carrageenan is used to stabilise cocoa in milk drinks (covered in a separate report). Many of these ingredients will provide both thickening and stabilising effects. 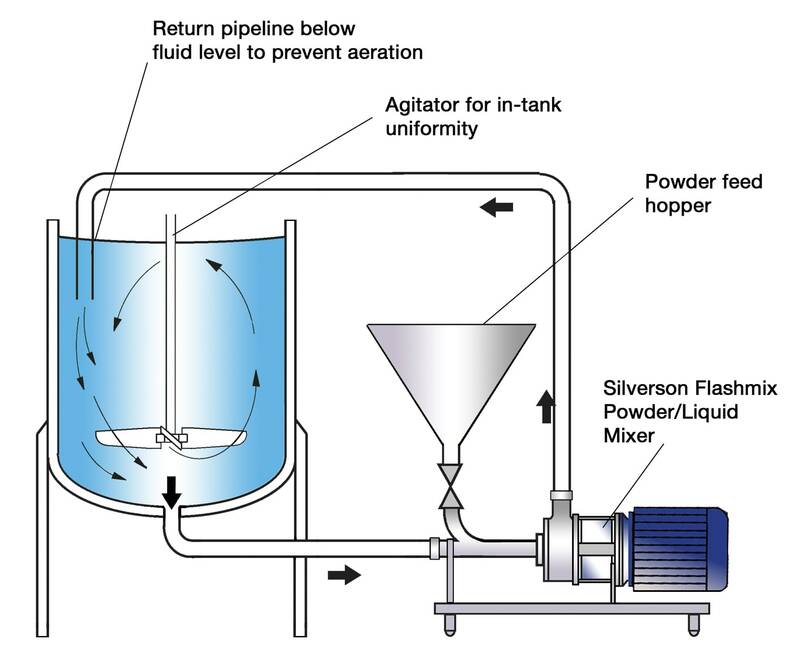 Depending on the scale of production, the thickeners/stabilisers may be dispersed directly into the batch, or separate premixes may be prepared for use in a variety of products. In either case, to obtain functionality from these products, they must be correctly dispersed and hydrated. A number of process requirements must be met in order to achieve this. The powder/liquid blending system must be capable of incorporating powders and dispersing them throughout the contents of the mix. The powders must be fully hydrated to maximise yield. A high degree of shear is sometimes required to achieve some products and fully hydrate them. Some ingredient types require heating in order to hydrate. Powder must be added at a controlled rate to reduce formation of lumps. 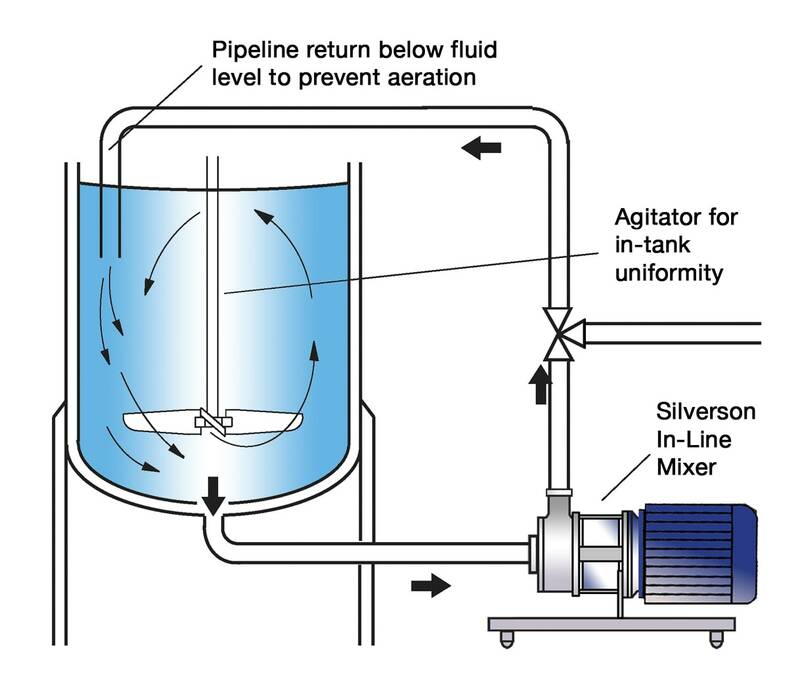 Conventional agitation systems do not product sufficient shear to break agglomerates down. Premixing of powders, (normally with sugar) is often carried out to reduce agglomeration; this increases costs and time. Where concentrates of functional ingredients are being prepared, the viscosity increases appreciably, making mixing more difficult. Long processing times can be required to properly disperse the powders and complete hydration. Incomplete hydration also reduces yield of raw materials. Many formulations contain unnecessarily high levels of these raw materials to compensate for poor yield and process inefficiency. 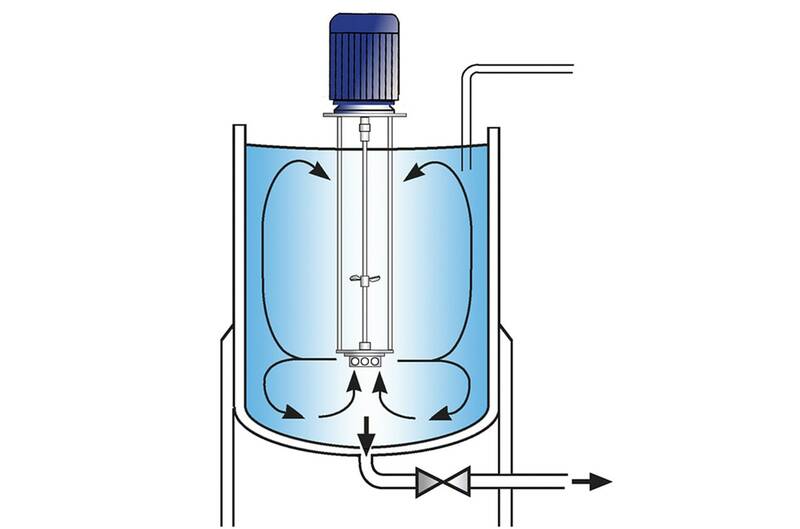 The vessel is charged with water and the mixer is started. Powder is added and rapidly incorporated into the water. The high speed rotation of the rotor blades creates a powerful suction which draws the liquid and powdered ingredients into the workhead. The particles are deagglomerated in the gap between the rotor and stator. The product is forced out of the stator and projected radially back into the body of the mix as fresh ingredients are drawn into the workhead. All the powder is rapidly absorbed and dispersed. 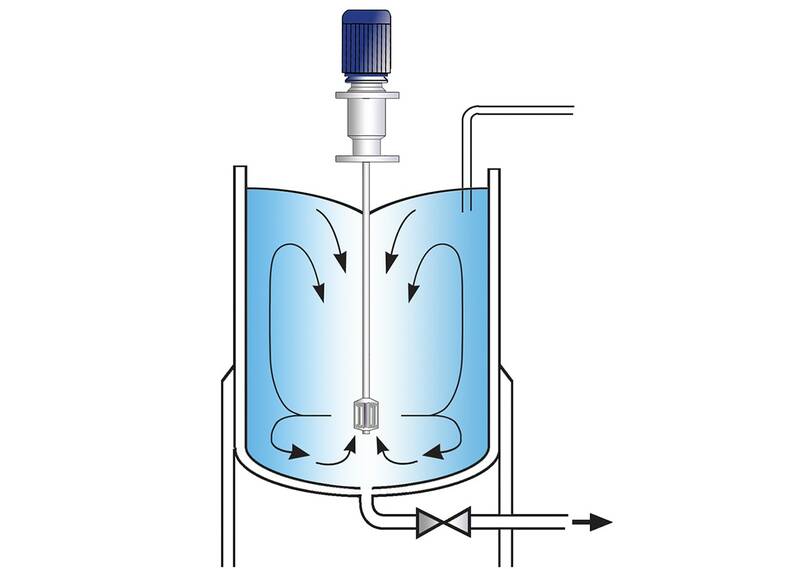 In a short mixing cycle all the material passes through the workhead, progressively reducing the particle size and exposing an increasing surface area to the surrounding liquid, accelerating the hydration process. Dry premixing is not required. Ability to start up or stop process quickly for processing of ingredients on demand.